All tomatoes, all the time! These are birthday tomatoes... they were roasted, then jarred, wrapped in a pretty red gingham napkin, tied with a ribbon and lovingly delivered to Ruth, in honor of her birthday. We are eating them fresh, standing in the garden. They are actually bursting with flavor. We sent a bag home with Anna Banana and cousin Barbara. Tomorrow, I will roast more. It may seem a bit much, at the moment, but in February we will revisit these pictures, and sigh. We will leaf through seed catalogs and moan softly. In February, we will know just how dear these summer days are. Yeah, tomatos! 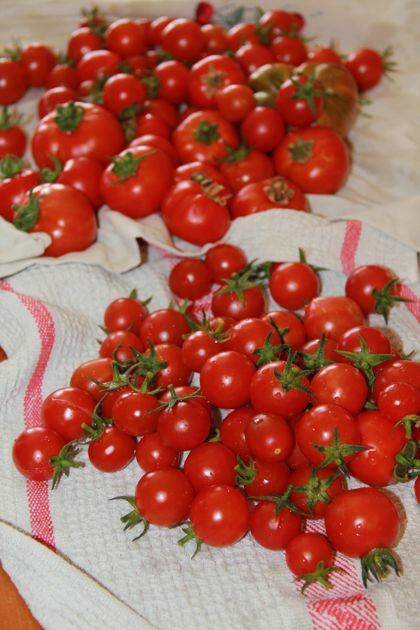 I love tomatos, they are one of my favorite foods! I can never get enough of them! I miss my fresh garden tomatos. We don't have a garden anymore because our well cannot support watering a garden and providing water for our house. Oh well, I will drool over your blog until I can get to the store to pick up some tomatos. ha ha ha!! I just volunteered at the annual tomato tasting day at the Farmers' Market this morning. It's coast-to-coast 'maters all up in here. Yum!! What an amazing haul! Mine are getting close.. a few straggling San Marzanos and the first Black Krim have ripened, but there is a lot of green out there, and I can't wait for them to start tumbling in. No such thing as too many tomatoes! Looks yummy and eye candy, You can also toss the roasted tomatoes with pasta (penne or the spirals or whatever) with olive oil, salt, pepper, fresh basil and feta (you can add chicken)! yum! 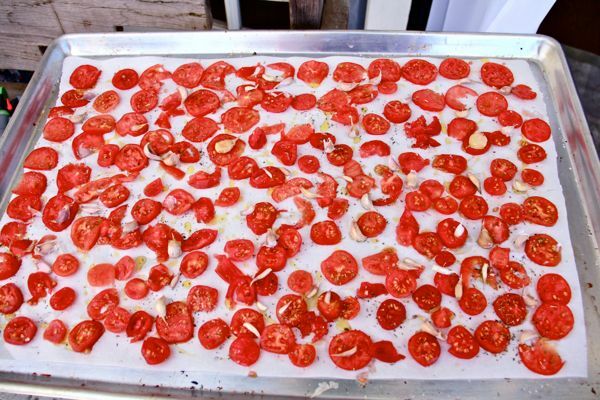 I usually roast the tomatoes with sliced garlic, they taste so good and are very good for you!